The album that kick-started the redneck craze, "You Might Be..." was originally released in 1993 and became a word-of-mouth hit. Warner Bros re-released the disc in 1995 and watched it sell four million copies. 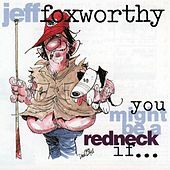 Eventually, Foxworthy's affectionate poke at rednecks would go on to become the biggest-selling comedy record of all time. Single Life Is Just Too Hard/Single Life Is Just Too Hard Cont. 1993 ,1993 Warner Bros. Records Inc.